There was quite a lighting storm last night; huge bolts every ten seconds for several minutes. It was very late and I was trying to keep awake to see it. Thunder frightened Chloe, and she tried to find refuge under the covers, but I suspect she found it far too hot and left abruptly. Friday I wanted to wear shorts to work in the worst way. I even put them (the tweed, very trouser like ones) on, and contemplated it. I think it probably would have been okay, but I didn't really feel like enduring any sort of commentary from anyone. I went with my pinstriped pants instead and wore my brown flats from my challenge. The verdict is in. They are not comfortable and they are going. There is no point in keeping a flat that hurts your foot. To satisfy my shorts craving, I wore them all weekend. Forever 21 is offering a free shipping code. This is one of my greatest weaknesses as I hate shopping at the B&M locations -they are always such an unruly mess- and I hate paying for shipping. Today had more stormy skies, and I held out, hoping the rain would stop and I could get a photo with some nice rim light. Not so much. But at least the rain stopped. But I did wear this new top. I loved it on the hanger, but now that I see it on, I'm not so sure. You can totally see my bra though the lace. Either I need a really gorgeous racerback bra, or something that would work layered. Have you entered to win a $60 Gift Certificate to CSN Stores yet? I too love watching thunder storms! There so beautiful! What adorable tops your wearing! The last one looks very unique! These outfits are lovely. The first top especially has a fabulous shape. i love the first two tops! the first one is the prettiest color! that last blouse is really pretty! I love it! && I've so totally been eyeing that same top from F21.. free shipping code, you say? Ohno, don't tell me that.. hahaha! You find the best tops at TJ Maxx! Great draping details and love the collar ont he second one~! Cats, dogs and thunderstorms don't mix well. I do love the look of the last top but see what you mean about the lace. I think the last look is great!! I love the floral top and the black shorts together. 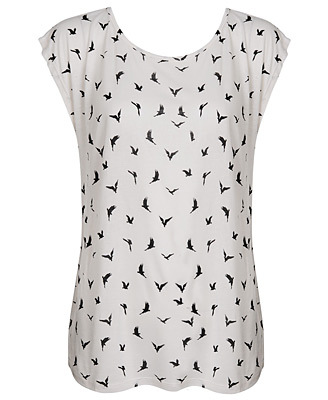 I saw that bird print top the other day, actually, and it's very cute! I used to order things online from Forever 21 a lot more than going to the store, but a lot of their products look much cheaper in person than they do online, so I've stayed away from that for a while. We had a storm over the weekend as well - trees fell all over the place and a lot of roads were blocked. That top is really pretty. I like the watercolor effect and the sheer inset. It looks like fireworks! I know what you mean about shipping. For the time it takes to arrive they could send it USPS for much cheaper and still arrive same time if not sooner. Love the top picture so much. The cut on the pants and the flowy top = beauty!! The last outfit is the best! So colorful. You could wear a tube inside =) GORGEOUS!! Haha, I don't like paying for shipping too. Thunder and lightening scares me, I hide away if I can. Cute top, but seeing bra straps is definitely embarrassing more than anything! I guess you can try to sew a white material to go just behind the lace? It's such a gorgeous top. love your outfits! all of them are fabulous! I've been having a wicked shorts craving too. I want either rockin' tweed ones (like yours!) or the perfect dark denim bermuda. I must have them. Love the Khaki top in the first pictures. And the Black and silver sandals! The bird top is really nice top, very miumiu! Love all of your wonderful looks! Especially the tops they are just dreamy, all of them! Lyddie I like so many things from your pictures ! First that green top with the ruffles on the sides. I peeked at the tweed shorts and liked them, I think they would have gone great with that top. I want that J Crew coral top it's fabulous ! And the top on the last post looks good as is.... I don't think you need anything but a skin tone bra or maybe just use a strapless. My dogs hate thunderstorms and go insane. I was going to say I liked your top, and then I saw all your outfits, and I love them all! They're so cute! I'm so in love with all of your outfits; but especially that first green top. It is so pretty. Fabulous ruffled green top! Perfect for summer. The shorts you wore on the weekend are a great neutral colour and go wonderfully with that coral top! I think the other top looks really nice too, but I know what you mean, I'm always really self conscious if there is any sign of a bra! I've yet to experience a thunderstorm during the summer time yet--just hot weather (100+ degrees, low humidity). My favorite top is that multicolored top! Your hair is so darling.I really like the last blouse pictured... so pretty! its been storming like crazy here to but since i love the rain i cant complain. love your blog!! saving it to my list! Great style! The blouse is very nice. What wonderful outfits, all around! such adorable tops! i want them all! Those tops you wore are soooo pretty! ooh and i did take some hot air balloon pictures! maybe i'll post them sometime. I love the bird print top that you so carefully picked out!! I can't wait to see it up on the blog!! I love the bird top, and thank you for the code! I'm with you on the shorts, we should TOTALLY be able to wear them to work - duh! XO! There's so much to love in this post! And I'm totally with you on giving the uncomfy shoes the boot (pun!). Life's too short to wear bad shoes. 'Nuff said. I miss lightning storms, I used to go out on the porch with my mom, even if it was the middle of the night to watch them. CSN Stores $60 Gift Certificate Giveaway!